Randall Arauz (of Petroma), Alex Khajavi (of Nature Air) and Carlos Manuel Uribe (of Amigos de la Isla del Coco) are included in the list of world’s most influential environmentalists and share place with legendary fighters from natural resources such as Paul Watson of the Sea Shepherd. 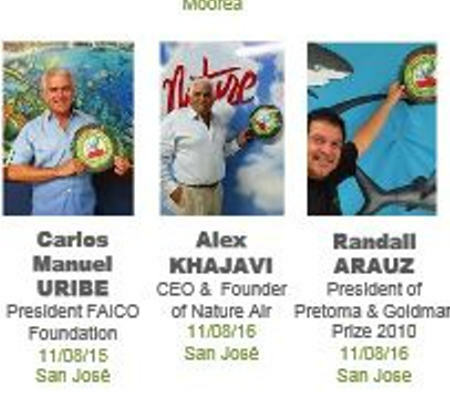 From June 3rd -5th, the Founding Congress of the Green Games was held in the UNESCO Building in Paris, France, where Arauz, Khajavi and Uribe were chosen as one of the “100 Guardian Angels of the Planet.” The event took place in the framework of the Global Conference – International Forum for a Sustainable Development. The objective of this first meeting was to validate the principles of the Green Games and officially launch the project to the media. The Green Games are considered to be the beginning of a new era, an era of transition, the theme of the Eighth Edition of the Global Conference – International Forum for a Sustainable Development.